The interior packaging is the first layer of the packaging applied to the product .It is directly applied to the material and prevents the material from external shocks and vibrations. It enhances the shipment capabilities and enables better transportation of the goods. The different types of packaging material such as loose fill, encapsulated-air plastic sheeting, inflatable packaging, kraft paper, polyethylene foam (PE) and polyurethane foam (PU). These materials are of low density, lightweight and soft. The global interior packaging market is anticipated to expand at a CAGR around 8.0% during 2018-2027. The increasing demand for the better quality products with long life is anticipated to be the primary reason for the growth of the global interior packaging market during the forecast period.The global interior packaging market can be segmented on the basis of material, design, end-user and region. On the basis of material, it is sub-segmented into aluminum foil, plastic, coated papers and others. On the basis of design, it is sub-segmented into printed and un-printed. Printed sub-segment is anticipated to fastest developing sub-segment during the forecast period. The increasing application of the printed design in enhancing the safety and security of the product is anticipated to be the key factor for the sub-segment to lead the segment during the forecast period. On the basis of end-user, it is sub-segmented into pharmaceuticals, health supplements, food & beverages, pet foods and others. Food & beverages sub-segment is anticipated to lead the end-user segment during the forecast period. The increasing application of the interior packaging in foods and beverage industry on the account of the increasing demand for the sustainable packing solutions coupled with rising need for the safety of the foods and beverage from contamination. The interior packaging solutions offers ease in storing and handling of the commodities which is anticipated to be a major growth driver for the global interior packaging market during the forecast period. The interior packaging offers the transportation of the goods to distinct places in both solid and liquid form. Thus, it is anticipated to be a growth driver for the global interior packaging market during the forecast period. The interior packaging maintains the aesthetic nature of the product. The increasing demand from various end-user industries is anticipated to boost the growth of the global interior packaging market during the forecast period. Furthermore, the expansion in the e-commerce industry is also driving the interior packaging market worldwide. 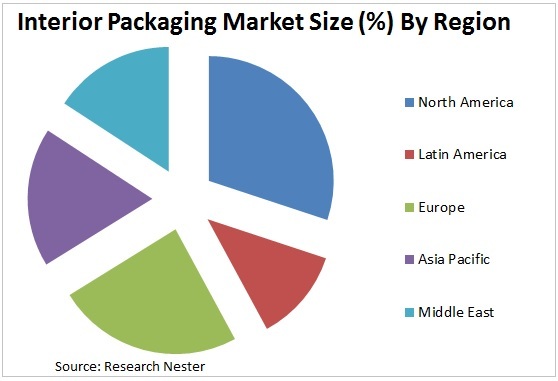 However, relatively less demand from the developing nations is expected to hinder the growth of the global interior packaging market across the globe.